Dimensions 0.50 by 7.25 by 10.25 in. Beginning Interpretive Inquiry importantly makes the distinction between the use of Ã¢ÂÂinquiryÃ¢ÂÂ rather than interpretive research or interpretive evaluation. Richard Morehouse explores how inquiry is a far more inclusive concept that allows for a detailed understanding of both research and evaluation. The author draws on his personal experiences and observations that many academics and practitioners in education, psychology and many other academic disciplines are successfully engaged in both research and evaluation and that in practice these enterprises share much in common. This book provides detailed examples of different projects; some that are primarily research oriented, others that are primarily evaluation; and projects that effectively and seamlessly combine both research and evaluation. Complete with case studies of a wide variety of interpretive inquiry projects this vital new book is an essential tool for researchers from a wide range of disciples. It will help them plan, conduct and evaluate research that successfully blends both qualitative and quantitative approaches. 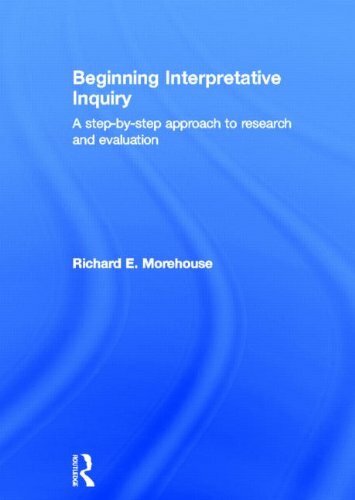 About: Beginning Interpretive Inquiry importantly makes the distinction between the use of âinquiryâ rather than interpretive research or interpretive evaluation.